My day seems to have revolved around drinking copious amount of lemon juice in hot water sweetened with honey and taking intermittent doses of Strepsils (proprietary medicine). The reason: my throat is doing a very passable imitation of the roughest grade of sandpaper. Naturally I have been felling sorry for myself; so while scanning my befuddled brain in search of an antidote to this morass of self-sorrowfulness I remembered that it was an age since I made an entry in my Thank You book. (a gratitude diary ideally used daily to list people/things/places you are grateful for). 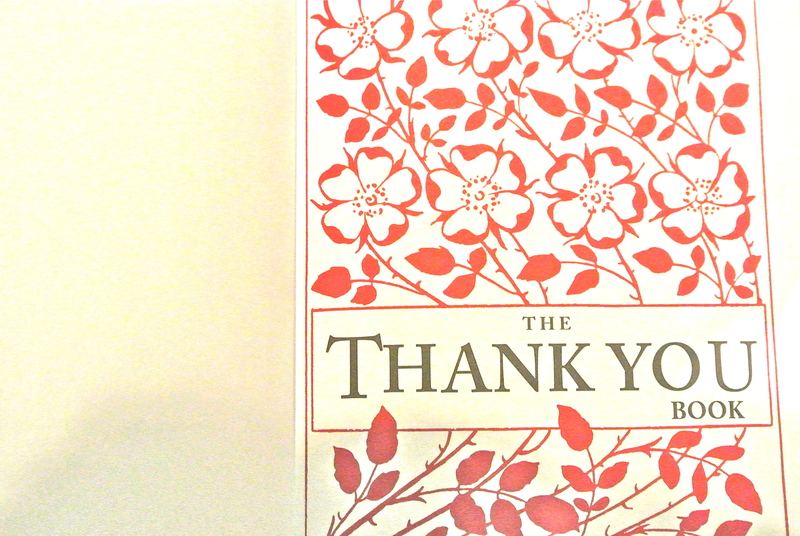 The Thank You book was one of the first things I wrote about on the blog here. As well as an introduction by Marie Murray, a leading Irish clinical psychologist, it has some short entries by local celebrities listing things they are thankful for. Otherwise the pages are blank for adding one’s own gratitude list. 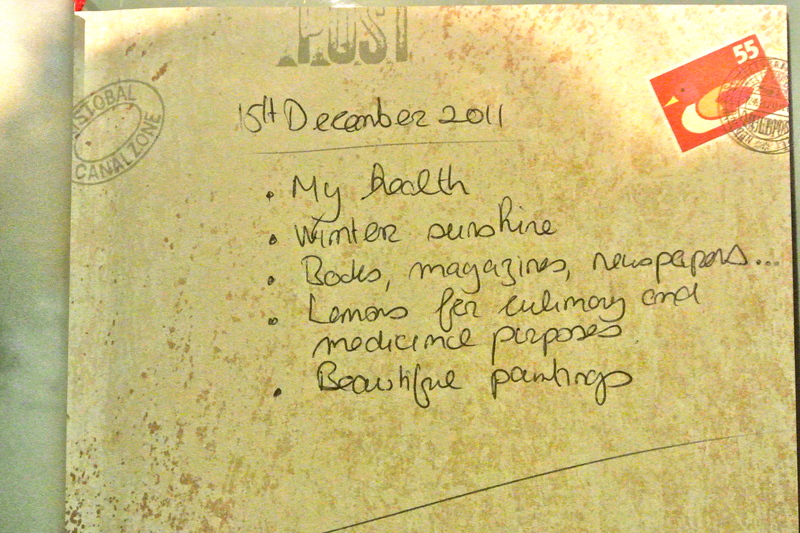 I made a quick list of things that I am feeling grateful for at the moment. Making the entry has not of course cured my sore throat but has acted as a timely reminder that I have much to be thankful for, including my normally excellent health. Thanks so much C for your good wishes. A good reminder to us all. I like the picture of the lemons. 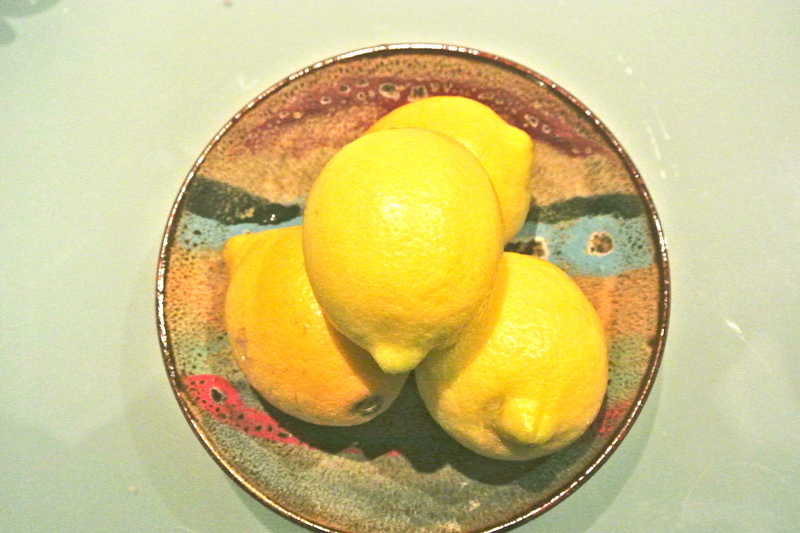 It makes grateful that lemons are both beautiful and beneficial to our health. They are beautiful. They are one of the few things that I always always have in the kitchen. Lovely journal… I think my blog is my journal. I just feel so sorry for you sitting there with a bad sore throat! If you lived closer I’d make you some chicken soup with rice:) Get lots of rest and drink lots of water, ya’ hear! Thanks so much Smidge for your good wishes. I bet your chicken soup with rice is fab. I too think of my blog as a journal. Lastly thanks for the reminder about drinking losts of water – I had thought about it. Be well, my lovely! I do know the power of all sorts of positive thinking, especially gratitude. And lemons! Just looking at the pretty picture of them is like an instant shot of sunshiny Vitamin D. Bright yellow seems so inherently joyful somehow. And by the way, you are one of the bright spots in my life that I consider wonderfully worthy of my gratitude. Swift healing, dear! Thanks Kathryn for that. Lemons are so cheerful and yes yellow is joyful. I hope you are feeling better soon. It sounds as though you need a good rest. Thanks Debra. This weekend is dedicated to resting in between a few things that need to be done before Christmas. Hope you feel better soon. Wishing you a joyful Christmas and a happy New Year.